Recharge or often referred as charging a battery, is an attempt to reverse the chemical reaction of the battery (accu, accumulator). When producing the electric power, liquid acid in the battery reacts with battery cells, and forming deposit accumulation in battery cells. Sediment will be accumulated overtime on battery cells, battery liquid acidity will be lower acidity, battery cells are no longer in contact with battery acid, then the battery voltage and current will be decreased, or battery flat. Recharging the battery is an attempt to remove sediment in battery cells and return that sediment into water to increase water acidity. If sediments on the battery cells are too much accumulated and in a long time, then battery can not be recharged again and needs to be replaced. There is an opinion stating that sediment in the battery cells can be cleaned by filling the battery with hot water to wash and drain battery cells. But there is a risk of damaging battery cells. There is also a chemical substance to reduce sediment in battery cells, it is added every month. In my opinion, the battery is not designed for this chemical way. Where this chemical or additive goes after it cleans battery cells? I let you to analyze, to try and to conclude it yourself. It is clearly shown above that chemical reaction when discharge is the opposite of chemical reaction when charging. If battery cells are not damaged, and no other substances that may interfere, then both reactions always can be done. If discharge and charging are always done at the right time and with proper procedure, then battery life can be extended. To recharge a battery, it needs a slightly higher voltage than the battery voltage. For 12 volt battery, the charging voltage is 14 volts. According to the specification, 12-volt battery is fully charged when the voltage is 14.4 volts, some can be recharged up to 15 volts without damaging the battery. So as a general rule, 14 volt is charging voltage, and if the battery is full then the voltage will be equal to the charging voltage which is 14 volts. Read also "Power Supply, Battery Charger, With Transformer", and wind turbine as battery charger in "Pico Wind Turbine With Bicycle Wheel". When charging, battery produces gas and water vapor. So before charging, clean battery top by a damp cloth to avoid dirt enters into the battery, and loosen battery caps and let them hanging loose on their hole. This way will ensure gases to exit and prevent prevent battery explode while keeping dust out. Actually battery cell caps are ventilated, but it is likely those vents are blocked or not enough to ensure gases go out. Add distilled water (pure water) if the battery water level is lower than maximal. Battery charger can be either an adapter that converts alternating current (AC) from the city grid into direct current (DC). Adapter is widely available in the market, choose adaptor with voltage 13.8 Volt, which is typically used by radio amateurs for radio communication and it is usually referred as power supply, see the picture below. According to the terms commonly used in everyday life, the adapter is a device for changing alternating current from city power grid, into direct current.While the power supply, is an adapter that has a voltage stabilizer. Adapter is cheaper than power supply. A special battery charger with large current capacity, over 40 amperes, which can be used to jump start, has a very expensive price. Battery charging current is about 10% of the maximal current that can be produced by the battery. For example, a 40AH (ampere hour) battery capacity is capable to produce 40A current for one hour, so the charging current is 10% of 40A which is 4 amperes. To recharge 40AH battery, it needs an adapter or power supply with capacity of 8 amps, or 2 times the charging current. If less than 8 amperes then there is the possibility of battery charger or power supply is getting too hot and burnt. Charging current is determined by the voltage difference. Battery charging current will be larger if the difference in battery voltage to charger voltage is higher. For example: a battery is recharged when the voltage is as low as 11 volts, with 14 volt battery charger, the charging current will be greater than if the same battery is recharged when its voltage at 13 volts. Large charging current will cause high heat and more gas is formed. In Smart Battery Charger system, charging voltage can be set automatically to prevent the formation of large amounts of gas. The principle of charging a battery is similar to principal of two connected water vessels as shown below. 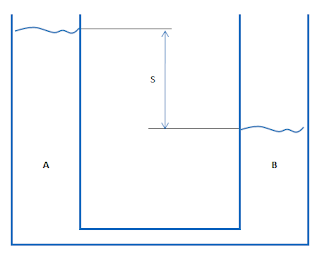 Vessel A is containing higher level of water and it is connected to vessel B with water level difference S. Water will flow from A to B, water will stop flowing if there is no difference in height of A-B or S=0. Flow will be greater if the difference in water level increases. If the battery voltage is less than 12 volts, then it takes about 8 -10 hours to charge the battery to rise it’s voltage to 14 volts. If your power supply or adapter voltage can be set to 12 volts, to prevent high gas formation due to very low battery voltage, it is preferably to recharge battery with 12 volts setting first and then continue with voltage of 14 volts setting. There are also a battery charger with current setting, not voltage setting, then use a low current setting first when charging a very low voltage battery, in order to reduce gas formation. It doesn’t need to remove battery connections, nor it doesnt need to remove battery from vehicle, so you can do it in your home garage. See the photo below, it shows a battery which is connected to a charger while the battery is still connected to vehicle electrical system. Also can be seen that the battery top is clean, with all caps are loosened so that gas can get out, but all caps are remain in their holes to prevent dirts entry. Connect positive cable of charger battery positive pole and negative cable of charger to negative pole of battery, see the diagram below. Connect the positive cable first. Negative cable can be connected to the vehicle body, not necessarily on negative battery terminal. Due to vehicle charging system limition, if this battery recharging is done regularly every 1-2 months, or when the battery voltage drops below 12.6 volts, it can extend battery life to about 5 years. After fully recharged, the voltage will drop quickly to 13.2 volts, and then goes down slowly to 12.6 volts (open circuit voltage) in 12 hours. 12.6 volts open circuit voltage is the voltage of battery 12 hours after fully recharged and then left without any load (lights, vehicle alarm, clock, etc. ), specific gravity of battery acid 1265 grams / cc. Open circuit voltage for a 6 volt battery is 6.32 volts. When the open circuit voltage as low as 11.7 volts then the battery is considered as empty, battery water density 1120 g / cc. For 6 volt battery, will be considered empty or flat if the voltage is 6.0 volts. Maximal voltage when recharging to avoid large amount of gas formation is 14.4 volts (gassing voltage). All voltages above are measured at room temperature 20 degrees Celsius or 68 degrees Fahrenheit, and if temperature increases then voltage must be adjusted by -0.022volt / degree Celsius. Please note that the negative temperature coefficient, the cooler the higher voltage. For detail to suit your battery, please refer to specifications of your battery manufacturer. Dry cell battery usually has lower recharging voltage 13.8 volts, while lead-acid battery can be up to 14.4 volts recharging voltage. Watch test video on vehicle for battery and electric system condition interpretation by voltage, please read "Battery And Charging System Condition Interpretatio Voltage". Do not smoke near the battery when it is recharged, battery gases are flammable and may explode. Water inside battery is extremely corrosive and can damage clothe and paint, flush with fresh water if exposed to battery acid. Do not start the engine when the battery is being recharged by adapter or power supply, because that tool is not able to provide enough current to turn the starting motor, adapter or power supply can be burnt. Disconnect at least one cable from the adapter before starting. Unless you recharge the battery with a battery charger that can supply very large currents, can be above 40 amperes, so that it can be used to jump start the engine. Wrong cables connection can cause electrical short, may result adapter burnt and battery may explode. Use proper size fuse can reduce the risk of burning. Fuse size is about 10% of battery capacity, eg for 40AH battery, then use the 5 amperes fuse. To protect adaptor and battery, fuse is installed to adapter output, not to adapter input, or between the adapter and battery. Fuse on adapter input, will protect grid if adapter short.